The great-granddaughter of a man from North Carolina’s Tyrrell County, Inglis Fletcher (1879-1969) was born in Alton, Illinois. She spent the first half of her adult life with her mining engineer husband in northern California, Washington State, and Alaska, once moving twenty-one times in five years. She had already published two successful novels by 1934, when a search for information about her Tyrrell County ancestors piqued her interest in North Carolina’s early years. She spent the next six years researching, writing, and editing Raleigh’s Eden, an historical novel about Albemarle plantation families from 1765 to 1782. 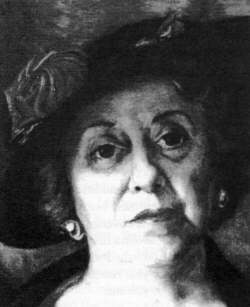 Between its publication in 1942 and 1964, she produced an additional eleven novels which eventually became known as the Carolina Series, covering two hundred years of North Carolina history from 1585 to 1789. Her established working pattern was to spend one year researching and one year writing each volume. Inglis Fletcher was a firm believer in extensive research for her novels, so committed to accuracy that she would not begin to outline her plots until she was steeped in details of everything from historical events to what people ate and wore. Her favorite characters and their descendants reappeared from book to book, taking part in intricate plots, wild adventures, and love stories that blended with actual past events and personages. When Raleigh’s Eden was criticized by native Tar Heels for historical “errors,” she publicly countered all accusations with documented quotations. Books in the Carolina Series have been translated into seven languages and have sold millions of copies. The author tied her books together with a common theme, attempting to demonstrate man’s freedom, symbolized by the ownership and love of the land he cares for, fights for, and passes on to his children. She hoped that the history she retold would give meaning to the problems of the present. The Fletchers moved to North Carolina in 1941, and became deeply committed to their adopted home, present at almost every literary or historical meeting in the state. At Inglis Fletcher’s instigation, the first North Carolina Writers Conference was held at Manteo in 1950. She was awarded an honorary degree by the Woman’s College of the University of North Carolina and received the first North Carolina Award for Literature in 1964. Her papers are in the Manuscript Collection of the Library at East Carolina University. Buy the book from your local bookstore or at Amazon.com. 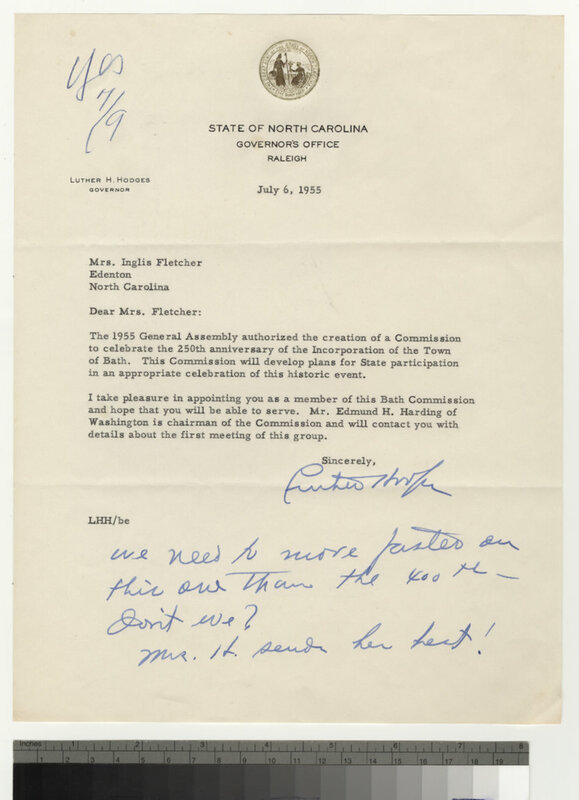 View additional correspondence at East Carolina University’s Joyner Library. Visit Inglis Fletcher’s page at the University of North Carolina University Library.